The viola part for Prokofiev's Symphony No. 1 in D major (nicknamed the Classical Symphony), Op. 25 has been edited by Israeli-born Yizhak Schotten, an internationally acclaimed musician whom STRAD Magazine has called "one of America's finest viola players... a leading light of the U.S. viola establishment." Schotten's bowings, fingerings and other editorial markings have been added throughout the score. Sergei Prokofiev began work on the Classical Symphony in 1916, but wrote most of it in 1917. Prokofiev's Symphony No. 1 can also be considered one of the first neoclassical compositions. It is written in loose imitation style of Haydn (and to a lesser extent, Mozart), but it also strongly reflects modern compositional practices and Prokofiev's own voice. The symphony is in four movements, and a performance typically runs only about ten to fifteen minutes. 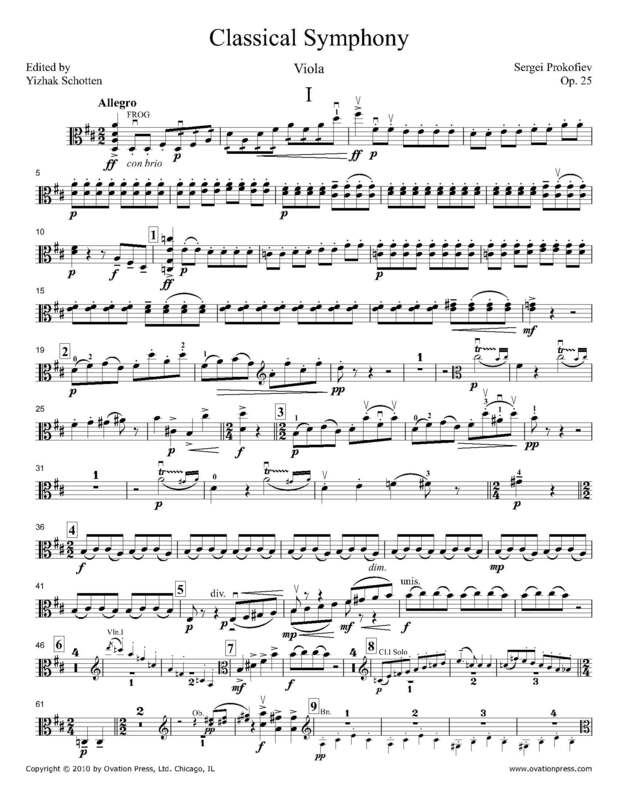 Download and print the score today to gain access to expertly edited Prokofiev Classical Symphony viola fingerings and bowings from Yizhak Schotten! Click here to preview a recording of Prokofiev's Classical Symphony as found on Yizhak Schotten's Orchestral Excerpts CD. To purchase the CD, which includes written and spoken commentary, click on the image below.